It wasn’t so long ago that Marc-Andre Fleury was one of the hottest goaltenders in the NHL. It feels like an eternity ago, but there was a time when Fleury was a 25-year-old coming off of a Stanley Cup victory, ready to take the league by storm. As he battled through the 2007 and the 2008 postseasons, Fleury led the league in playoff wins, saves and minutes, getting the ring in that second stint. In the seven subsequent seasons, Fleury never seemed to take that next step while at the same time remaining a solid goalie. Besides a shortened 2012-13 season, he never won fewer than 34 games nor had a goals-against average worse than 2.40 after that championship defense season. And yet, from 2007 through last season, Fleury recorded 69 ‘Really Bad Starts’, a stat developed by Rob Vollman to count how often a goalie lays a figurative egg. Vollman began counting RBS in that 2007-08 season, and Fleury is tied for second among all goaltenders in most bad starts (in which he gave his team less than a 10 percent chance of winning the game). Only Steve Mason has been worse more often since the stat came into existence. But with the bad came good as well. Fleury led the NHL in shutouts in 2014-15. He was the Penguins’ guy in goal up until injuries sidelined him and forced rookie Matt Murray into goal last year. At that point, Murray took the job and ran with it, putting together a simply magical beginning to his career that continued through Pittsburgh’s playoff run. Now instead of Fleury preparing for a new year, he isn’t quite sure he has a job or even a home. Rumors had it that the Penguins were shopping him around the league, looking for a trade offer for the goalie with three years at $5.75 million per season still remaining on his deal. How could the team justify paying that for a backup goaltender when a much younger and cheaper player proved he is capable of starting everyday? But it would be wrong for Pittsburgh to trade away Fleury. They need to hang onto him for a couple of reasons. First, Murray played well in his opportunities, but those chances have not been numerous, and he has already proven susceptible to injury himself. He has just 13 career regular-season starts. The 22-year-old has more playoff starts than regular-season starts in his brief career. No one is sure if he can handle a full 82-game NHL season and the 60+ starts that come with a starting goalie job. He also didn’t make it healthy through the 30-odd games he played last season. Murray went down in the postseason, which allowed for a brief Marc-Andre sighting for a game and a half. And now, during the World Cup of Hockey, Murray hurt himself again, suffering a hand injury that forced him to the bench. Besides uncertainty in Murray’s long-term viability, there is also the issue of his actual NHL ceiling. Is this kid really this good? It couldn’t hurt to have a backup plan if the answer is no. 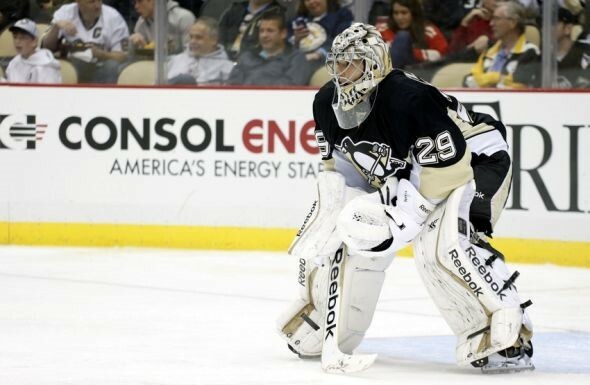 It will also do him good to have Fleury in camp to battle with for the starting position in the first place. There is no guarantee Murray will win out. Perhaps Fleury proves himself the best goalie on the team by opening night or, more likely, the two split starts for quite a while as Murray builds his endurance and Fleury proves his mettle. Pens fans may want the team to send Fleury packing because of his past struggles and large contract, but that contract makes him hard to deal. He also has a limited no-trade clause, which will somewhat impede a move. Memories are short in the sports world, but it is worth letting Fleury stick around and help this team this season.